Ground elder (Aegopodium podagraria) is a fast-growing, invasive, perennial weed that can spread quickly to form a carpet of foliage that will crowd out less-vigorous plants in beds and borders. young growth on ground elder. Ground elder is an herbaceous, invasive, perennial weed. It spreads via rhizomes (underground stems), which can regenerate from a just a tiny fragment left in the ground. Early in the year, shoots with dark green leaves burst from the soil. These are followed in late spring and early summer by tall stalks that support several flat heads of white flowers. There is also a form with variegated leaves. The flowers bear a resemblance to those of the elder tree (which is completely unrelated), and this gives the weed its common name. Spreading by rhizomes, ground elder can easily creep in from a neighbouring garden or nearby wasteland. It can also be unknowingly introduced with new plants if pieces of its fleshy, white rhizome are hidden within the compost of the rootball or are tucked away among the roots of the plant. 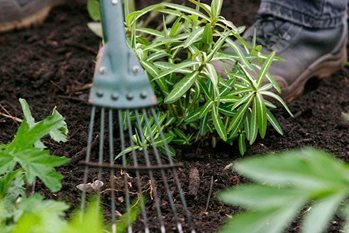 As its rhizomes are close to the surface of the soil, it is possible to reduce infestations of ground elder by removing it carefully with a garden fork. However, eradicating it completely needs vigilance as the smallest portion of root left in the soil will result in a new plant growing. Lift cultivated plants and carefully remove and destroy any pieces of ground elder rhizome from around their roots. After you are sure it has all been removed, replant your garden plants in clean soil or pots. The ground elder can now be evicted by digging, or by covering the ground with black polythene to starve the weed of light. It may take several seasons until the ground elder is completely destroyed. In new lawns, ground elder will usually be starved by repeated mowing, and should not persist for long.